City Lights Publishers - City Lights Publishe, 9780872865198, 232pp. Los Angeles Stories is a collection of loosely linked, noir-ish tales that evoke a bygone era in one of America's most iconic cities. In post-World War II Los Angeles, as power was concentrating and fortunes were being made, a do-it-yourself culture of cool cats, outsiders, and oddballs populated the old downtown neighborhoods of Bunker Hill and Chavez Ravine. Ordinary working folks rubbed elbows with petty criminals, grifters, and all sorts of women at foggy end-of-the-line outposts in Venice Beach and Santa Monica. Rich with the essence and character of the times, suffused with the patois of the city's underclass, these are stories about the common people of Los Angeles, "a sunny place for shady people," and the strange things that happen to them. Musicians, gun shop owners, streetwalkers, tailors, door-to-door salesmen, drifters, housewives, dentists, pornographers, new arrivals, and hard-bitten denizens all intersect in cleverly plotted stories that center around some kind of shadowy activity. This quirky love letter to a lost way of life will appeal to fans of hard-boiled fiction and anyone interested in the city itself. Ry Cooder, an LA native, is a world-famous guitarist, singer, composer, producer and writer. He is known for his slide guitar work, his interest in roots music, and, more recently, for his collaborations with traditional musicians from many countries including The Buena Vista Social Club. Cooder has composed soundtracks for more than 20 films including Paris, Texas. Two recent albums were accompanied by books of stories written by Cooder to accompany the music. ". 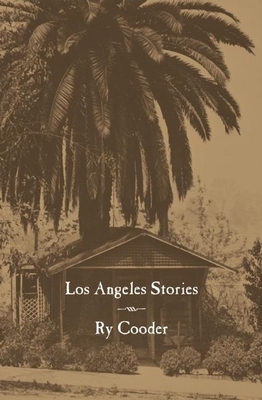 . . Ryland Peter Cooder ventures into new territory with his first collection of linked shortly stories, entitled (not surprisingly) Los Angeles Stories (City Lights) . . . Eight stories are set in post World War II Los Angeles intermingling the kinds of characters and narratives that Cooder has put to good use in his songs blue collar workers, small time criminals and all kinds of fauna to be found in the barely visible underclass." --Robert Birnbaum, "Our Man in Boston"